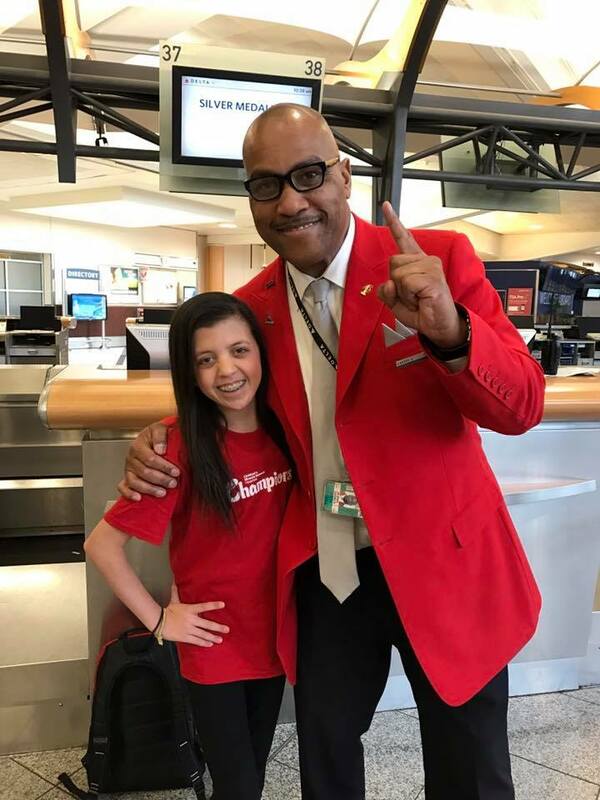 “Last year I was honored to receive Children’s Miracle Network GA Ambassador role to help raise money for kids treated at Children’s Healthcare of Atlanta just like me. As part of that role, representing Children’s Healthcare of Atlanta, I had the opportunity to travel to Washington D.C. last June. Our trip started out with being greeted by Delta employees who treated us like rock stars. They cheered for us and gave us small surprises and treats, and we were able to take photos and see the cockpit with the pilot. While there, I did interviews, fundraising, and I met other representatives from other states just like me. I met two families that are very close to my heart now. I met a girl named Talia from North Dakota, who had a brain hemorrhage, and a girl named Jakiah, from Arkansas, that had cancer and is now cancer free. They were the first people I met there, and we are close friends to this day. They are so sweet and fun to hang out with. I also got the chance to go into the East Wing of the White House and meet the Surgeon General of the United States, Murthy. I asked him questions on what research they were doing for heart defects. Also, while there I got to do some more exploring on my own time like getting to see the Lincoln Memorial, Washington Monument, and going to see the Tomb of the Unknown Soldier, which was pretty amazing. I did an interview with Miss America, Betty Cantrell, who is from Georgia. It was great meeting a Miss America from my home state. We were able to share my story and how Children’s Healthcare of Atlanta has helped in my care throughout most of my life. We also had fun photoshoots for Children’s Miracle Network and Dance Marathon. D.C. is an amazing city and I am thankful to have been able to tour and visit. Throughout this year, I have attended many Dance Marathons. Dance Marathon is where a bunch of college students get together and raise money for their local children’s hospitals. This year I have attended UGA, Ga Tech, Emory and Georgia State, which hosted their first ever Dance Marathon. One of the biggest ones here in Georgia is University of Georgia in Athens, Georgia. They are a lot of fun and University of Georgia dances for 24 hours straight. They even have a challenge called the standing challenge, and you can’t sit until the 24 hours is up. This year, UGA raised 1.3 million dollars just for Children’s Healthcare of Atlanta. That’s amazing! The money that is raised specifically benefits the CIRU at Scottish Rite. Students from all over the state work so hard throughout the year, and I am so thankful for each and every school that has raised funds. This March I had the honor to travel to Walt Disney World for Momentum, which is the National conference for Children’s Miracle Network. I was able to meet many of the corporate sponsors who make the care of so many children possible, just like me. I also was able to reunite with all my fellow Ambassadors from across the U.S. like Talia and Jakiah. I also met some new friends along the way like a girl named Delaney from Alabama. She is the sweetest girl you will ever meet. She was diagnosed with Spina Bifida but she doesn’t let that hold her back. When we arrived, they had people taking photos and letting us walk the red carpet. We even got to sign our names on a Hollywood star that was on the wall. We then hopped on a bus called Mickey’s Magical Express. The bus had a TV where they played Disney trivia and it was easy to me because I know everything there is about Disney! We got to the hotel which was the Coronado Springs Resort. We turned the corner and saw our friends waiting for us. It was so awesome to see them again. We went to the pool and hung out until we went to CMN’s welcome party. There was amazing music, food, dancing and hanging out with friends. It was a blast! We got to meet Marie Osmond who is one of the Co-founders of Children’s Miracle Network and Ali Simpson who is on Radio Disney. She was super sweet and works hard to raise awareness for Children’s Miracle Network Hospitals. We went to a couple parks during the week. We went to Epcot and did a Mickey quest with all of the other CMN ambassadors and corporate sponsors. I got to hang out with Greg Kennedy who is the Senior Vice President for Delta and his wife. He told us how much fun the ride Soarin’ is and we went and rode it and had a blast at Epcot! We also visited Animal Kingdom and Magic Kingdom throughout the week too. Later in the week we had an autograph party. I was able to meet corporate sponsors and sign autographs and share more about my story. It was so cool! 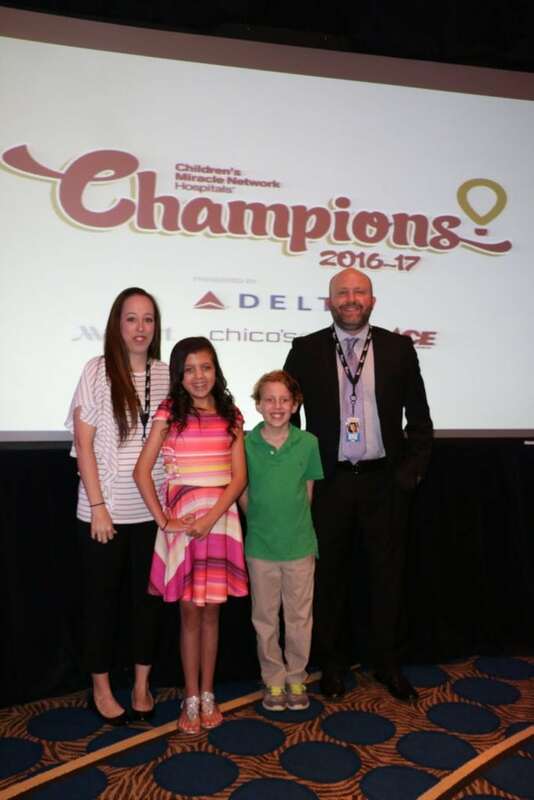 When our trip was coming to a close, we had a huge Medal Ceremony and CMN’s first-ever Facebook Live event! Each of us got to walk down a runway and meet Nick Cannon as he announced our name in his microphone. I took a selfie with him which was pretty cool. He was so nice! I also received a medal that says, “Champions 2016-2017” that is really special to me and something I will always treasure.